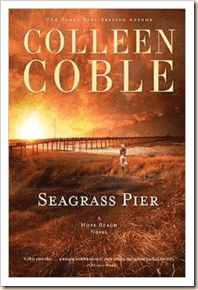 Colleen Coble has written another great novel!! I loved Tidewater Inn almost 2 years ago, and I thoroughly enjoyed Seagrass Pier too! The setting of these fast paced romantic novels takes place on the coast of North Carolina. Colleen has a gift in the way she illustrates a place in your mind, one that you have never seen and yet can imagine with perfect clarity! I feel like I am on the islands of the Outer Banks, I can almost feel and smell the sea breeze! I think that is one of my favorite things about her books, she takes you there, immerses you in the beauty! I love the characters too, as the main character Elin is adjusting to a healthy life after a heart transplant, her challenges were intriguing. I am not sure how real cell memory is, where a patient has memories from the person whose organs they received. However, the story was so interesting as Elin struggled with her new self. The thriller part of the book kept my attention as well. There is someone stalking Elin and her daughter and we are never quite sure who it is or why until the very end! This is a great summer read, but one that might keep you up to finish the last page! I enjoyed this book just as much as I did Tidewater Inn. I enjoy Colleen’s writing style and her stories and I look forward to reading more by her in the future!! In a secluded corner of Hope Beach, one woman must decipher a stranger’s memories . . . before they cost her everything. But when Elin begins having violent flashbacks—and vivid dreams of being strangled—she realizes that she has been the recipient of more than just a new heart . . . Elin is remembering her donor’s murder. Her strange affliction has attracted some unwanted attention: from the press, from the authorities . . . and from the killer himself. Now, living alone with her young daughter and aging mother, Elin is being stalked—by a man she’s only met in her nightmares. The police are dubious of her story, but one off-duty FBI agent is eager to help her: Agent Marc Everton. Now, in a remote cottage on Hope Island, Elin and Marc must probe the secrets buried in her borrowed heart. And there’s no time to waste. One man is desperate to silence her—before she remembers too much. NOTE : I was offered a copy of Seagrass Pier in exchange for an honest review, by LitFuse.